As you know, I love all kinds of flowers, but I have a special place in my heart for water lilies. These flowers spend their lives floating happily atop picturesque ponds, streams, and lakes. Along with being lovely, they fulfill specific purposes in a pond or stream’s ecosystem. This week, I’m celebrating July’s birth flower and one of my beloved favorites, the water lily. There are about 70 different species of water lily, including the giant water lily. Some of these incredible flowers are on display in London’s Kew Gardens. I mentioned that water lilies serve a practical purpose in an ecosystem, and that’s quite true. As an example, they provide a hiding place for fish, frogs, and other occupants of a pond. Also, they block sunlight, keeping the water at a reasonable temperature. This discourages the growth of algae in a still body of water, meaning that water lilies play an essential role in keeping ponds clean and livable. These freshwater flowers are seen in many different colors, such as red, white, purple, blue, pink, yellow, and orange. In addition to being colorful, many water lilies have a wonderful fragrance. One example is the American white water lily, also known as Nymphaea odorata. Where Do Water Lilies Grow? These flowers grow in water that is still or very slow-moving. They start their growth in the mud at the bottom of a lake, stream, or pond. The lily’s stem grows upward through the water, and the flower blooms on the surface. The leaves of this flower are called lily pads. The edges of a lily pad can be toothed or smooth depending on its variety. Some water lilies bloom at night, while others flourish in the daytime. Water lilies thrive from May through September. They require an environment with at least 18 inches of water and heavy garden soil for successful growth. I helped a friend plant some water lilies in the fish pond in her garden using aquatic pots. There is a bubbling waterfall at one end of the pond, so we planted the water lilies at the other end where the water is still. Today, she has a collection of delicate pink and white water lilies in her fish pond. Hardy water lilies will die back in the cold of winter but develop new flowers in the springtime. Lily pads are a well-known relaxation spot for frogs, dragonflies, water snakes, and even small turtles. 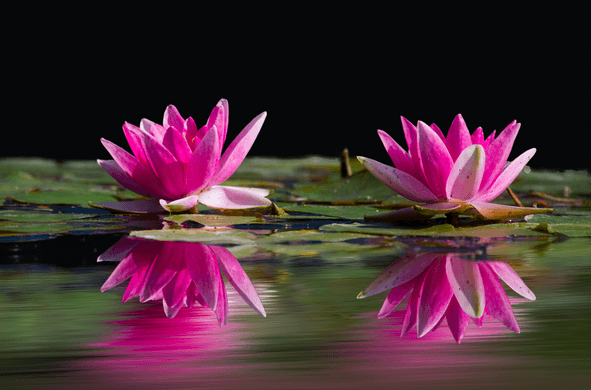 Water lilies are seen in a variety of shapes, including star, pointed, and cup-shaped. The water lily is the national flower of Bangladesh. The water lily symbolizes the feminine spirit as well as love and life. Take some time to admire the water lilies on your next trip to a lake, stream or pond. They are truly the queens of their own watery gardens!